For around two weeks from August 9th to 23rd 2017, 16 first-year students led by Associate Professor Naoki Maeda (Graduate School of Social Sciences) and two other faculty members participated in the 43rd START program, studying at National Chengchi University in Taiwan. For around two weeks from August 25th to September 11th 2017, 20 first-year students participated in the 44th START program and 26 second and third year students participated in the 1st START+ program. They were led by Associate Professor Aaron Claude Sponseller (Graduate School of Education) and two other faculty members to study at Flinders University in Adelaide, Australia. For around two weeks from August 26th to September 10th 2017, 23 first-year students participated in the 45th START program. Led by Associate Professor Naoe Kawamoto (Graduate School of Integrated Arts and Sciences) and two other faculty members, the students studied at Universitas Brawijaya (UB) in Malang, East Java, Republic of Indonesia. For around two weeks from September 5th to September 21st 2017, 24 first-year students led by Associate Professor Hisashi Kuwayama (Graduate School of Education) and another faculty member participated in the 46th START program, studying at Chulalongkorn University in Bangkok, the Kingdom of Thailand. Aside from attending lectures, the students joined field trip to local companies and Japanese companies based in Thailand, UN agency and others. For around two weeks from September 9th to 24th 2017, 30 first-year students led by Fuyuko Takita (Associate Professor at the Institute for Foreign Language Research and Education) and two other faculty members participated in the 47th START program. The students spent this time studying at James Madison University (JMU) in Virginia, U.S.
(*) The START Program, aims to send first-year students who have little or no experience in overseas travel to experience classes and everyday life at an overseas partner university and thus fostering interest in cross-cultural exchange and long-term abroad study. Established in 2010, by the end of the first half of the academic year 2017 the START Program has already been held 47 times. From 2017, we launched the step-up program called START+ Program for second and third year students. This program fees are supported by the Hiroshima University Fund and other patrons, giving more students the opportunity to study abroad with less financial burden. 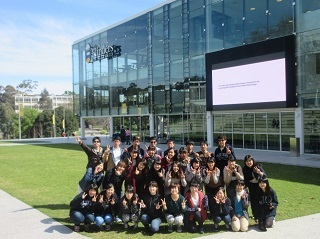 Students attend pre-study abroad session for 2 months and follow-up (post-study abroad) session after returning to Japan. Moreover, the START Program is offered as a general education credited course (‘Overseas Field Study’), aiming to improve participating students’ global core competency (the core skills needed to succeed anywhere in the world). Self-evaluation sessions are conducted three times (before, during, and after the study-abroad program) and students can plan their actions based on the result of their Global Core Competency. After receiving feedback from supervising teachers, students will refine and put their plans into action. Assessment is made by comprehensively evaluating the development of the student’s Global Core Competency based on their participation attitude, presentation during the program, and report after the program. After returning to Japan students set personal goals for TOEIC test and continue learning even after they completed the program.